Ok, now this one’s a special bottle. Not because it was an expensive gift or a particular finding. Simply because it’s a bottle that has just been there in our cellar, like forever. I guess my parents have once received it as a gift and just put it on a shelve. And myself, since I’ve been of “legal age” have simply been staring at that bottle as if it was some kind of perished ancient relict from a time when all wines were made to get an instant headache. What I didn’t know, but what my web enquiries taught me, is that there’s quite a myth attached to this winery. It has been founded and built with the looks of a castle in 1859 by a Bavarian German named Gustav Clauss, who consequently started exporting the wines back to Germany. During the 19th century the estate became a popular destination for Greek Monarchs and their guests: Otto von Bismarck and Franz Liszt allegedly stayed there. 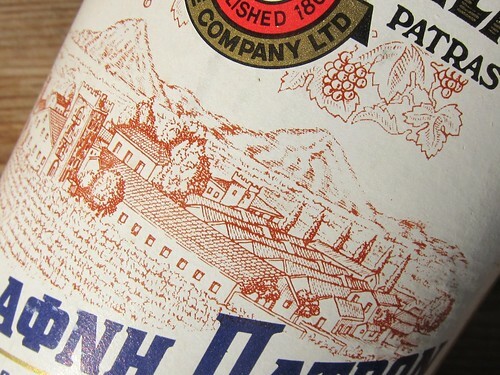 After the second World War the estate fell into Greek hands with the Antonopoulos familiy investing heavily (current owner is Nikos Karapanos). Interestingly the winery was again a jet set destination in the 1970’s when Aristoteles Onassis and Omar Sharif were regular guests (source: German Wikipedia). But what about the wines? 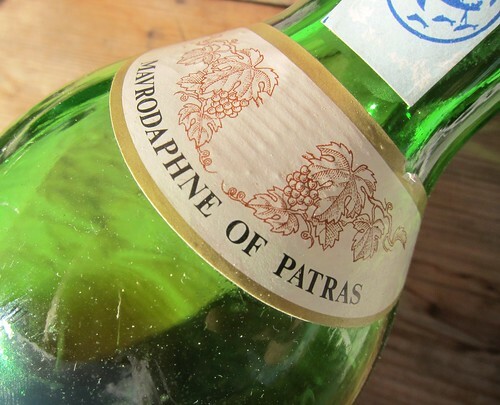 The story tells that Gustav Clauss introduced the Mavrodafni cultivar stemming from the Ionian Islands to the surroundings of Patras where the winery is located. 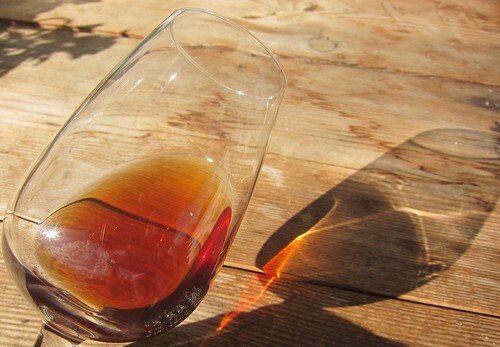 The wines are created through fortification, with addition of alcohol and apparently oxidation also plays a role, which means that the Solera method from Jerez might be employed, but I’m not sure I’ve got that right. The most conclusive source of information about the winery is within a report about Greek winemakers I found here. So what about the content of my bottle? When I first poured it I thought there wouldn’t be much hope with such a brown color, a possible symbol of decay. but when held against sunlight, the color gets the most brilliant shine, making it the most appealing chestnut brown ever. The nose seems a bit blunt and closed at first. 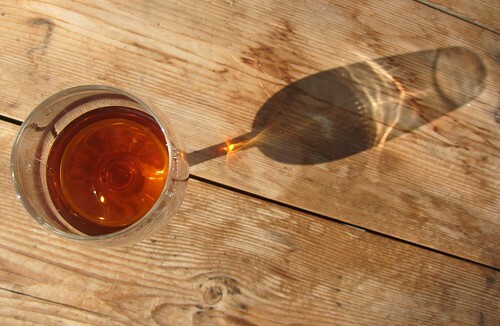 On the palate the wine appears with notes of malt, but also seems lemony and balsamic and is carried by a compelling acidity. Presence and length are more tham impressive for a wine this age and are probably supported by the remainder of 16% alcohol. During that time the nose opens up and displays the same intense aromatics, appearing balsamic, lemony with the addition of a dried herbs mix. Somehow there isn’t any sign that this wine has passed its time. It rather seems that it has entered a timeless stage where flavors and aromatics are bound for eternal pleasure. It has reached flavours that are more on the caramel and malt side, but with that sort of deep and tickling acidity it also holds a freshness and balsamic fruitiness that represents a juvenile kind of appeal. A wine to be indulged on its own, but supposedly also a match for some sophisticated desserts. Incredible! This is how one can underestimate a wine that’s been standing on the shelve forever. I’d be curious to find out more about it. Haha, I’m afraid there are not many such findings left.. Maybe you’re interested in some “Pfälzer Landwein”, judging from the dust I’d say the vintage is 1982 or 1983 :P! This one was a genuine lucky pick. Love to have some comments from connaisseurs of these types of wines though… my insights are to few here! 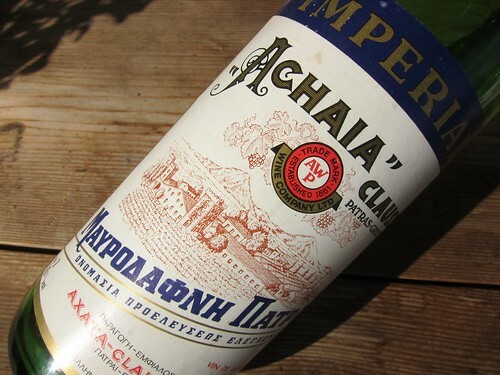 I recently bought on eBay a bottle of Achaia Clauss Mavrodaphne from 1873! I corresponded a bit with the winery and they do operate a solera-type system of topping up barrels with wine from the next-oldest vintage. But still, it’s pretty exciting that my bottle contains a decent % of juice from grapes squashed in 1873. Very interesting. I was looking at the history of the bottle that you are describing because I have exactly the same bottle and I am not sure what to do with it. I’ve had this bottle for about 8 years and prior to that it belong to a good friend who was into wines and unfortunately passed away. Hello Roman, thanks for your comment. I’d suggest you open the bottle and have a try when you have a relaxed moment of free time! Let me know how it was. 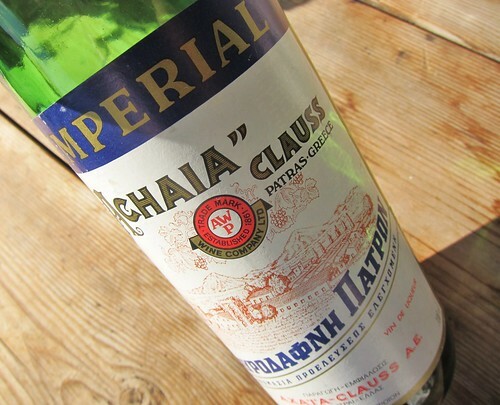 i have a bottle of white wine from achaia clauss. there seems to some sediment at the bottom and floats around when shaken. I have been given a bottle of this wine that was found in a wine cellar of a friend of mine mothers house. The label and bottle still look very new and there’s no floaters in the bottle. The number on it is 243/1969, is it safe to assume this means it was bottle 243 of a batch? Does anyone have any idea what it is worth, if anything? I, too, have a cellar find. CURIOUS WHAT YEAR. Absolutely no year identification and in original box. Same winery. Much older styling on label. 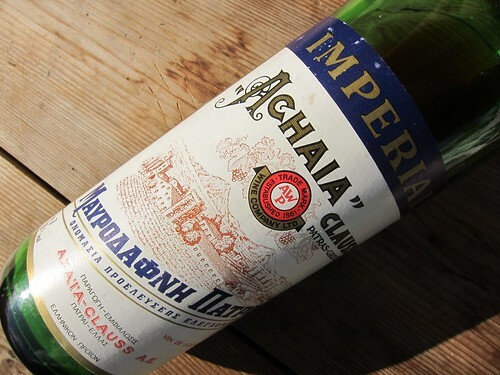 Upper label “Original 601 Mavrodaphne”. Most interesting is “NET.1PINT 7 FL.OZ.”, making it pre-metric… Also has liquor store’s sticker on box. No tax stamp nor signs there ever was. Possibly 1960’s, based on graphic styling. Also previous owners age and hunch it was a wedding memoir. Considering trading it for needed vehicle fuel in Florida. I opened my bottle of the 1873 for a 70th birthday. It was FABULOUS and the hit of the party. Concentrated, rich, had held up VERY well. A real treat!